The actor Emil Jannings is the German actor as such. You can say without arrogance that he even was the greatest European actor in his time, who had under no circumstances to fear the comparison with his American colleagues. Emil Jannings was born as Theodor Friedrich Emil Janenz in Rorschach, Switzerland. From 1900 he came in touch with the theater for the first time, where he worked as a unpaid trainee for the time being. Later he acted for touring companies. In the following years he worked his way constantly up und played in Nuremberg, Darmstadt, Bremen and finally for Max Reinhardt in Berlin. First bigger roles at the theater followed in 1917. He made his debut for the film already in 1914 in "Im Schützengraben/Der 12jährige Kriegsheld" (14), but his real career started in 1916. In the following four years he acted in "Aus Mangel an Beweisen" (16), "Nächte des Grauens" (16), "Die Ehe der Luise Rohrbach" (17), "Lulu" (17), "Die Augen der Mumie Ma" (18), "Vendetta" (19) and "Rose Bernd" (19). When played the role of Ludwig IV in the movie "Madame Dubarry" (19), directed by Ernst Lubitsch, it stand for his great breaktthrough in his film career. In the next ten years he went down in film history with his silent movies. He played in the successful productions "Kohlhiesels Töchter" (20), "Die Brüder Karamasoff" (20), "Algol" (20), "Anna Boleyn" (20), "Danton" (21), "Das Weib des Pharao" (21), "Peter der Grosse" (22) and "Tragödie der Liebe" (23). In the middle of the 20s nearly all ways led to Emil Jannings. He personified the leading roles in the international successful productions "Quo Vadis" (24), "Nju" (24), "Der letzte Mann" (25) - one of his greatest masterly performance, "Tartüff" (25), "Varieté" (25) and finally "Faust" (26). Because of his huge successes of his last movies he got a three-year contract with Paramount. In the USA he shot among others the movies "The Way of All Flesh - Der Weg allen Fleisches" (27), "The Last Command - Sein letzter Befehl" (27), "The Patriot - Der Patriot" (28) and "Betrayal - Verrat" (29). For his performance in "The Way of All Fleshs" and "The Last Command" he achieved the first oscar in film history at all. When the sound film rang in a new era, Emil Jannings feared because of his knowledge of English, that he doesn't justice to the artistic aspect of the English sound film and went back to Germany. His first film in Germany also caused a sensation and counts to the best movies of the 30's. The leading actress Marlene Dietrich lauchned her Hollywood career with this film. We are talking about ""Der blaue Engel" (30), where Emil Jannings played professor Unrat. But in the next years he wasn't able to go on from his earlier successes, only in the National Socialist Germany he became again a great star. In these years he played often historical personalities and was participated in some of important movies, which worked for the National Socialism. To his great successes of the 30's and 40's count "Der Herrscher" (37), "Der zerbrochene Krug" (37), "Robert Koch, der Bekämpfer des Todes" (39), "Ohm Krüger" (41), "Die Entlassung" (42) and "Altes Herz wird wieder jung" (43). After the war he was denazified in 1946 and got the Austrian nationality one year later. 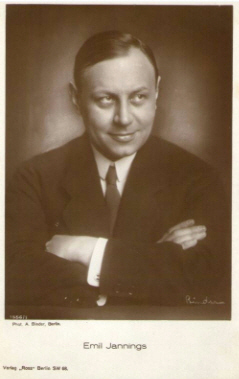 Emil Jannings was married in second marriage with actress Hanna Ralph (1885-1978), in third marriage with actress Lucie Höflich and in fourth marriage with actress Gussy Holl.